How do I ship an instrument? ​Before returning an instrument, be it from a tryout or rental, please take a picture of the front and back of the instrument and of the bow. These will be used if the instrument is returned damaged to find if it happened during shipment. To insure safe arrival of your instrument, make sure it is safely strapped within its case, along with the bow(s). Next, wrap the case in bubble wrap and place the case in a box that is at least 2” larger than the case on all sides. The case should be suspended in the center of the box with packing peanuts. Paper is acceptable to some extent, but peanuts and bubble wrap are the best form of protection. When taping the box, packing tape should be used, not duct tape. Several strips should be used crosswise on the lid as well as lengthwise. We will only ship Monday-Thursday to avoid having the instrument sitting in a warehouse over the weekend. If the weather is extreme such as NE blizzards, we will modify our shipping accordingly. How do I care for my instrument and bow? Please remember that heat destroys. Treat your instrument (including bow) like a baby or a pet. For instance, do not transport or leave it in a non-air-conditioned vehicle, not even when parked in the shade. Never put it in a vehicle’s trunk. Never leave it in the sun. Please make sure that whatever you stick on the instrument/bow (such as finger tapes) is easily, safely and cleanly removable. Do not stick anything onto the varnish. Always keep your instrument and bow in its case/bag (or on its stand with a covering over it) when you are not using it. Do not put it on the floor, on a bed, on a chair or couch, on a table or on a piano. Wash your hands thoroughly every time before you touch your instrument or bow. Keep all your fingernails on both hands clean and clipped short. Use your bow only to make music, not to tease the dog or cat etc. Loosen your bow whenever you are not playing. Never touch the hair of the bow, the strings of the instrument at the bowing area, or the rosin itself. Finger oils prevent rosin from sticking to the hair or strings rendering it unusable. Rosin the bow hair daily, in long strokes from the frog to the tip. Wipe the instrument, its strings, and the bow stick with a soft cotton cloth to clean it. You may also use designated cleaner and polish as directed. When you ship your violin, please do not wrap or cover it in paper towels, only use wax paper. In heat the paper towels will stick to the varnish and damage it. what does rental INSURANCE cover and exclude? ​The rental insurance that we provide will cover accidental damage to the outfit (instrument, bow, and case). If the instrument is cared for using the below list, accidents are covered. Willful harm to the any part of the outfit will not be covered and the full purchase price or repair costs less rental credit will be charged. -The outfit cannot be exposed to extreme climates such as excessive heat, cold, and high or low humidity. If exposed to high heat or cold temperatures, slowly acclimate the instrument it to a normal environment over several hours, to prevent damage to the wood or varnish. -Insurance does not cover string use or wear. How long a set of strings lasts will largely depend on how many hours they are played. Generally, they should be replaced yearly. When it is time to replace, we will be happy to put a new set of your choice on the instrument. When cleaning the instrument, wiping down the strings with a clean cloth will help prevent a rosin buildup. -Excessive rosin buildup will damage the varnish and will require repair. After playing, wipe off the strings and body of the instrument with a clean cotton cloth. Violin specific cleaners and polish may be used as directed. Never use any furniture polish or cleaner not designed for instruments of the violin family. -The bow is to be tightened enough so while playing, the hair does not touch the stick – or as instructed by your teacher. After playing, ALWAYS loosen the hair so that they are not under tension. Failure to do so will warp the stick and that will not be covered. As with wood, bow hair also moves with the humidity. If it becomes impossible to fully loosen the hair or fully tighten it, the bow needs to be rehaired. This is covered. Touching the bow hair will deposit oil which will prevent the rosin from sticking to the hair. It is very important to not touch the bow hair. -If the soundpost ever falls over, setting it back up will be covered. Should this happen, loosen strings right away to prevent damage to the top of the instrument. The soundpost supports the pressure of the strings and without it, the top will deform. ​​Does my bow need to be rehaired or repaired? ½ or more of the hair as broken and/or fallen out. What about repair? These are some of the warning signs that something else is amiss. If any of these events are occurring, please give us or Arroyo Bows a call to have the situation corrected. Bow health is just as important as that of your instrument. Problems can compound and get worse as time goes on. Is an old violin better than a new one? We have seen (and heard) many "gone dead" old violins at Gainesville Violins. Be assured that any top-quality brand-new violin will have been made from thoroughly seasoned old wood – VERY old wood - and will carry a life-time warranty regarding excellence of material and excellence of workmanship. It is safe and logical to choose the best-sounding instrument (old or new – it is irrelevant) in your price range from a legitimate and knowledgeable dealer and to forget the theology, dogma, superstition, illogical thinking and snake-oil. 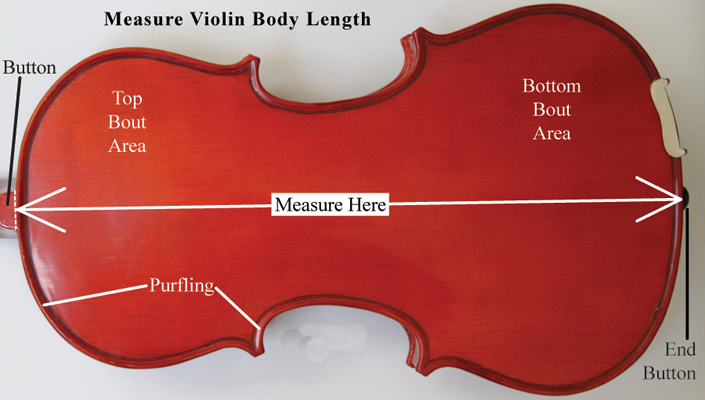 Why should i buy from gainesville violins? We are often asked what makes our instruments different, or better, from that of a general music store or an online retailer. There are a few things that we do to make the different. Our instruments never come out of the box and go straight to the shelf. They always get inspected to make sure all parts work and are of a high quality. If the bridge and sound-post are not good (often they aren’t), then they are replaced with custom cut replacements made for optimal playing ease. If the strings are not a high quality name brand (again, they normally aren’t), then they are replaced with a better set. Our shop favors Vision and Dominant strings for this. Next, the pegs are treated to turn smoothly and all string contact points are smoothed and lubricated to cut down on string breakage; a huge problem in low end instruments. Finally, each instrument is played and the sound post adjusted until it sounds as good as it can. All of this takes up to a few hours. If you were to buy one of those cheap instruments and bring it to us to make work, these are all of the things we will do to it, but now you own the instrument with no assurance it will sound the way you want it to. We want you to buy the best violin you can get, and for that reason we offer 10 day risk free try outs. If you aren’t happy, you won’t be stuck with the wrong violin. Beyond all of this, our Luthier is trained to do a wide range of repairs for most any situation and offers tonal adjustments as the years go on. Violins are never in a fixed state. They are constantly moving so yearly upkeep is vital to the health of the instrument. Our shop is a full service shop. what size instrument does my child need? ​We generally revert to the judgement of the teacher, but we can also size the child to tell you what instrument is needed. If you cannot come to the shop, for violin/viola you will need to measure from under the child’s chin to their wrist. From that information, we can tell you what size is needed. For cello, we need to know the distance from the floor to the child’s heart. Some teachers will tell you the size needed but please note, for fractional instruments the measurements vary within each size category. For this reason, to avoid confusion, we prefer to work with measurements rather than fractions. To find the size you have, please follow this photo for guidance. That information will help us and the teacher find the next size needed.